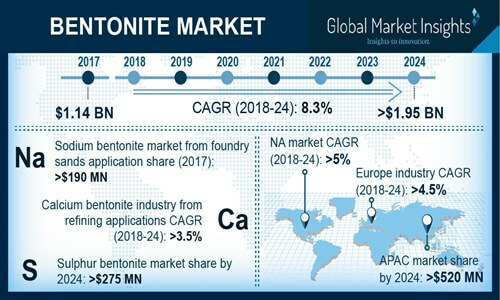 Bentonite Market size is set to surpass USD 1.95 billion by 2024; according to a new research report by Global Market Insights, Inc. Booming steel industry in India, China and South Korea on account of increasing foreign direct investment from U.S. and Japan has boosted the iron pelletizing industry and may promote growth of bentonite market size. The product is used as a binding agent, offer improved mechanical & abrasive strength, faster reduction and higher mineralization rates compared to ore fines which increases the productivity of sponge iron with less energy consumption. The product imparts structural stability to iron pellets, extracts moisture, improves drop strength and thermal resistance which may accelerate market growth. Declining community involvement owing to rising urbanization has led to rising pet ownership to fulfill companionship needs, which may stimulate bentonite market growth. This product majorly finds usage in clumping cat litter owing to its ability of absorbing fluids and forming clumps. The complete absorption of urine helps in removing undesirable odors and some manufacturers also add odor control additives such as baking soda or charcoal or chemical fragrances to improve product performance. Sulphur bentonite market size from foundry sand applications was valued at over 680 kilo tons in 2017. This product, along with aggregate and water is a major ingredient of green sand, a hydrated mixture commonly used in the metal casting industry. The product helps sand particles adhere to each other, imparts high green, high & hot strength and possesses beneficial swell properties, which may boost bentonite market growth. Germany calcium bentonite market size from civil engineering applications may register gains close to 4% during the foreseeable period. The country is witnessing economy recovery, rising government investment on bridges & roads, declining interest rates and a booming population which has led to a resurgence in the construction sector. The product is commonly used in slurries owing to its ability to stabilize & seal excavations, allowing easy replacement by concrete, cost reduction and recycling which may accelerate bentonite industry growth. China sodium bentonite market demand from refining applications may surpass USD 3 million by 2024. The country has witnessed rising crude oil imports pertaining to increasing oil import quotas passed by the government and growing crude supply from the booming North America shale industry. Acid-treated clay materials are routinely used to bleach oil for removing contaminants such as iron & copper ions which improves refining productivity and may boost bentonite market growth. U.S. calcium bentonite market share from drilling mud applications may witness gains at about 5.5% over the forecast timeframe. Improvements in drilling & fracking technology in the country has led to increased oil & natural gas production thereby boosting demand for drill muds. Drilling fluids help in creating boreholes in the ground to access petroleum reserves and bentonite helps keep the stone detritus in suspension when purge pumps are idle, which may increase product demand. Halliburton, Wyo-Ben, CETCO, Delmon Group, MIDPOINT Chemicals and Minerals Technologies are some of the prominent industry participants in the bentonite market. Manufacturers are expanding their production capacity and mining operations to improve the availability of raw materials, lower costs and achieve market growth.